Last night I did something that would have seemed trivial just 3 years ago. I went to a coffee shop after dinner to get some work done. Alone. It seems completely silly, but spending an hour in a place that wasn't my living room or home office where I'm constantly reminded of the other little tasks I have to do was refreshing. My mind wasn't telling me to dust the corners of the room or reorganize the shelves; instead, I could focus on myself and my work. I listened to some of my favorite music, sipped on some hot tea, and accomplished more in those 60 minutes than I expected. You'd think I would be running out the door at lightning speed to get some time alone. The truth is, I struggled to get myself to leave the house. I kept thinking about Riley's little arms giving me a "hug-o" and his sweet little good-night-smooch that I would miss if I left. Even one night without that makes me a little sad. Plus, being a stay-at-home mom has made it difficult for me to relinquish control of what happens in my house at any given time of day for fear that things won't be done correctly. No offense to my husband by any means, but I have my routines. That's normal, right? Even if it was only one hour, that little jaunt to the coffee shop changed my entire outlook. It was a deep breath; a chance to look at the world beyond the daily this-and-that. Yes, I missed the usual bedtime routine, but when I got home, the house was quiet, the dishes were done, and all was well with the world. In the spirit of looking at things in a new, fresh way, I'm sharing these BLT quinoa patties with you. It's the perfect light lunch whether you are home or at work. The quinoa patties, adapted from Heidi Swanson's cookbook Super Natural Everyday, are the perfect base for a fresh, lemony mayonnaise, a thick slice of roasted tomato, and crisp applewood smoked bacon. In place of the lettuce (and because I wanted to be a little fancy) I used sprouts. Let's pretend I can still call this a BLT. This time of year does not always produce the nicest tomatoes, but if you can find fresh ones that don't need help by roasting you can just slice them and be done with it. I chose to roast mine on the same pan with the bacon to help concentrate their flavor and take them from hard and sour to soft and sweet. Worked like a charm thanks to my tin foil barrier. One pan and done! Take a little time for yourself and enjoy something delicious, a little fancy, and mostly healthy. You can thank me later. In a large bowl, combine the quinoa, eggs, salt, chervil, onions, garlic and cheese. Stir to combine. Add the panko and stir. Let the mixture sit for about 3 minutes. Using slightly wet hands, shape the mixture into patties that are about 2 1/2 to 3 inches in diameter and about 3/4 inch thick. Heat the oil in a large, heavy pan over medium low heat. Place 3 or 4 patties in the pan, cover, and cook until brown and crisp, about 7 minutes. Gently flip the patties and cook them on the second side until brown, another 5-7 minutes. Transfer the patties to a cooling rack. Continue the process until all the patties have been cooked. Combine the mayo, lemon zest and lemon juice in a small bowl. Season with salt and pepper to taste. Top a quinoa patty with about 1 tablespoon of the mayo, a slice of tomato, and a slice of bacon (break the bacon so it fits on the patty). Finish with a pile of sprouts and serve. 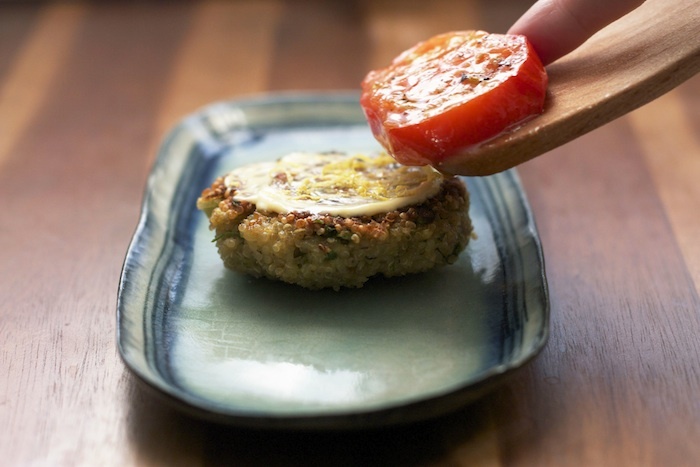 Recipe for the quinoa patties adapted from Heidi Swanson's book Supernatural Everyday.